Are your Christmas decorations the same style as they were ten or twenty years ago? Or perhaps your decorations have changed like many other Americans' decorations. What better way to spot old and new traditions than with a Christmas blog tour! Today is the fourth day of a week long tour, Cozy at Christmas. Katie at Let's Add Sprinkles organized over twenty bloggers to share our homes for this Christmas. Thanks, Katie, for inviting me, and thanks to all of you for visiting. I think you will find some ideas to inspire your Christmas decorations this year. December is such a busy time of the year, but the hustle and bustle of the holiday month always fills me with CHEER. Earlier this week several Texas bloggers gathered for lunch in McKinney, TX. We had a grand time laughing and catching up with the latest exciting news. There were a few secrets shared about upcoming events for some of the bloggers. I can't wait to see to their secret projects revealed in the coming months. 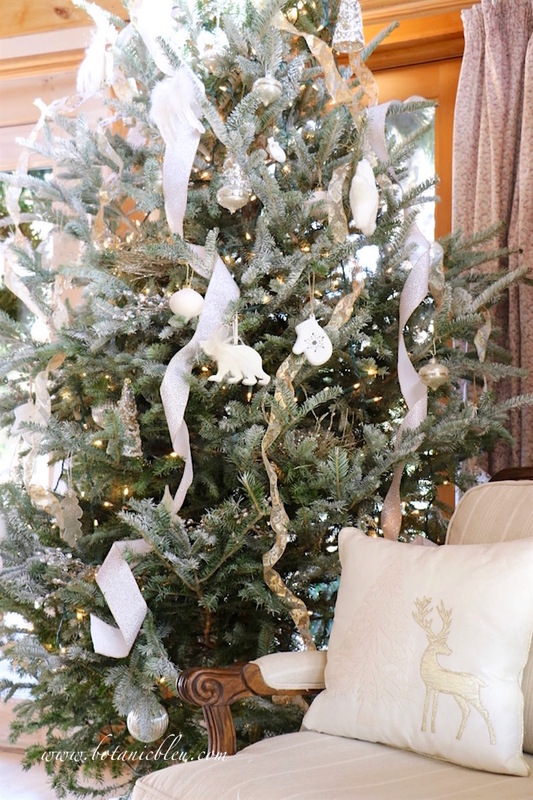 See the entire schedule for the Christmas home tour at the end of the post. You will want to visit everyone to spot the old and new traditions in Christmas decorations. Every generation develops new holiday traditions mixed with older traditions from their families. Christmas decorations are areas in which some of the most noticeable changes have occurred over the past fifty years in the United States. Decorations have evolved in our homes from mostly natural holly, ivy, magnolia, and fir greenery to using artificial sparkly lights and glittery ornaments. Houses, shrubs, trees, and fences outlined in Christmas lights are now common exterior sights. So much so that new small businesses for residential Christmas lighting services have sprung up. Inside, Christmas decorations include glittery artificial centerpieces, mantel displays, and tree ornaments. 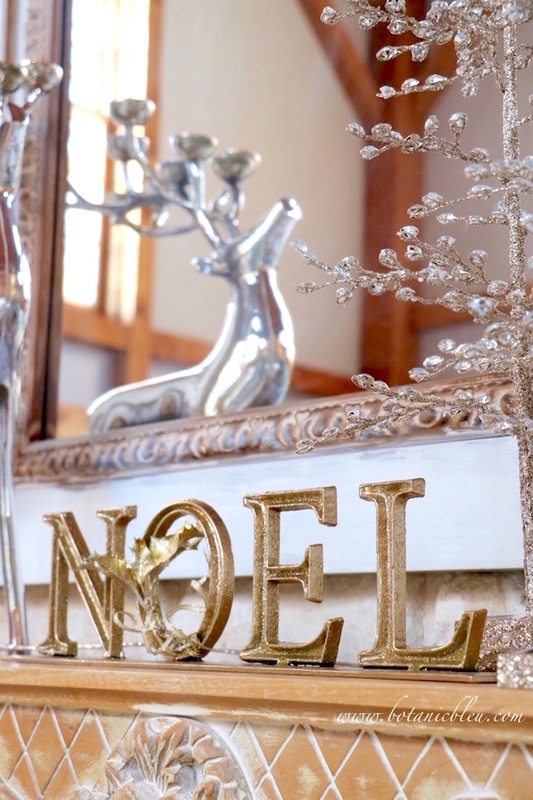 Glittery, sparkly decorations beginning with a gold metal NOEL sign caught my eye this year. Traditionally, I have favored fresh greens with few artificial ornaments. But, this year, my house is filled with sparkle added to fresh evergreens. Sparkle is not totally new to my mantel. The large silver-colored reindeer first appeared in the late 1990s when our house was on the local women's club Christmas tour of homes. Lots of greenery on the mantel accompanied him that year. 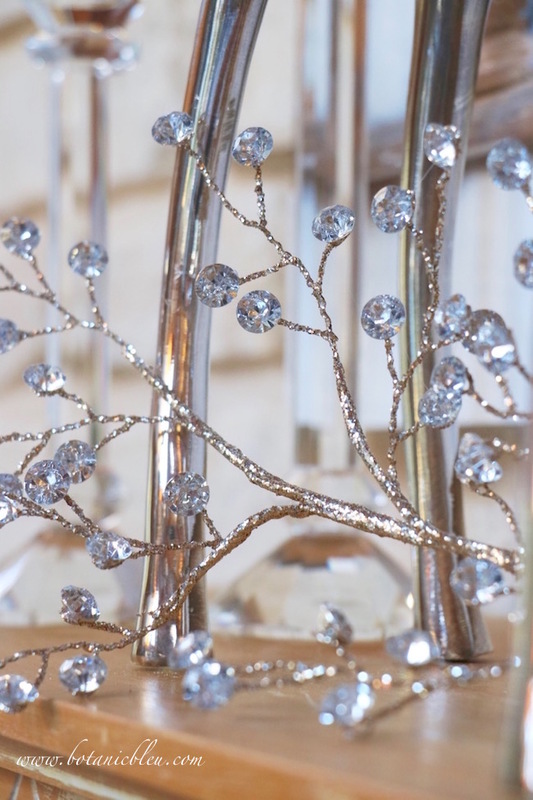 This year a trio of jeweled glitter trees reflect in the mirror. 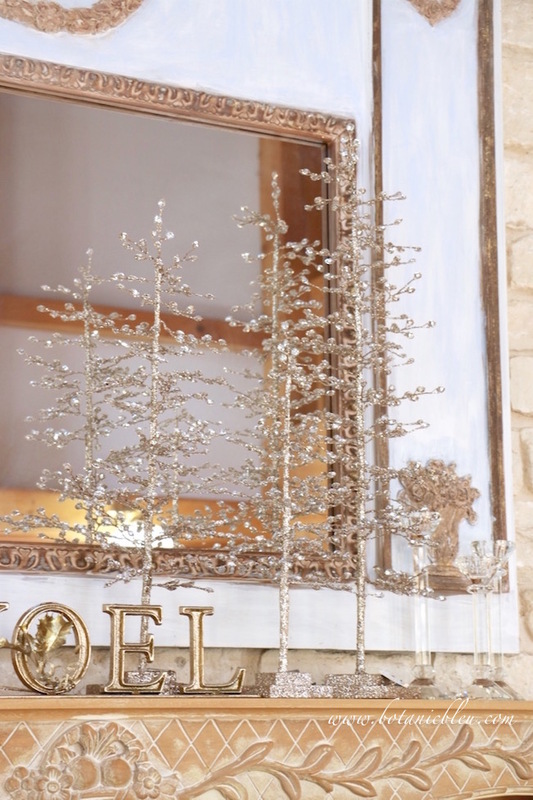 At first there were preserved eucalyptus branches also on the mantel, but after seeing the photos I decided the eucalyptus detracted from the sparkly trees. 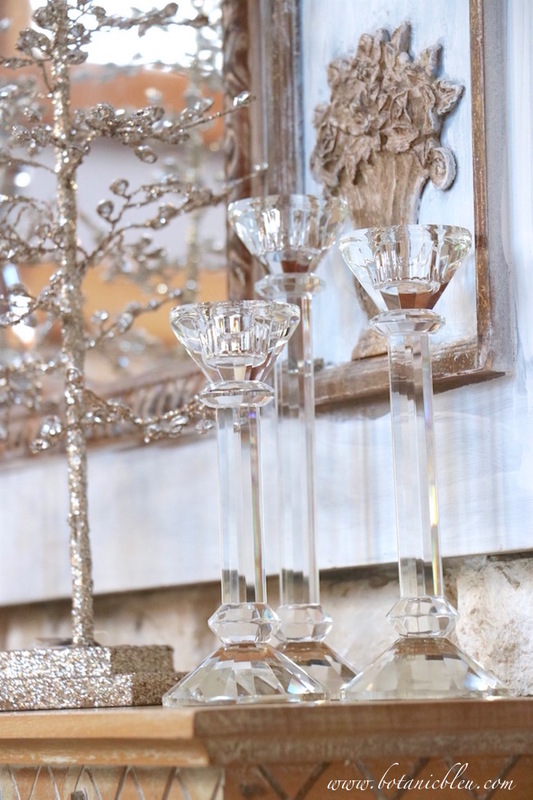 Crystal candlesticks add more sparkle to the glittery trees. A single jeweled glitter spray shines brightly under the silver reindeer without the eucalyptus branches. 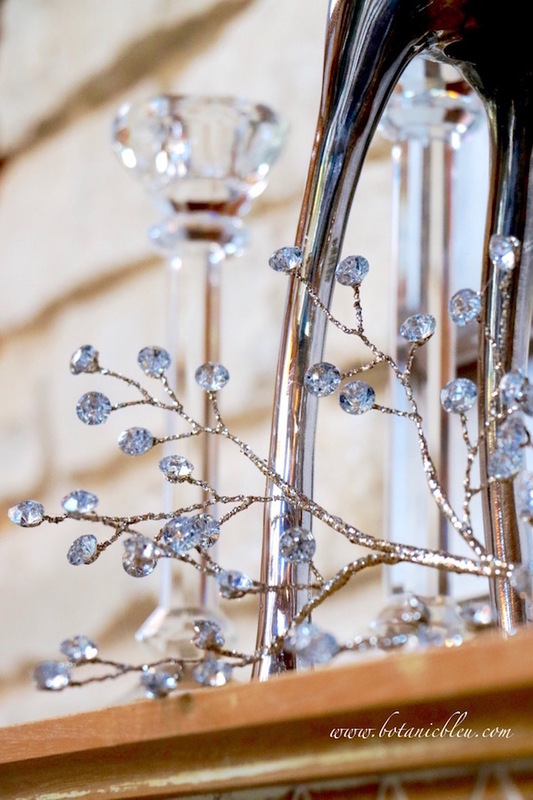 Fauceted crystal spray stems sparkle with clear crystal, silver, and black. 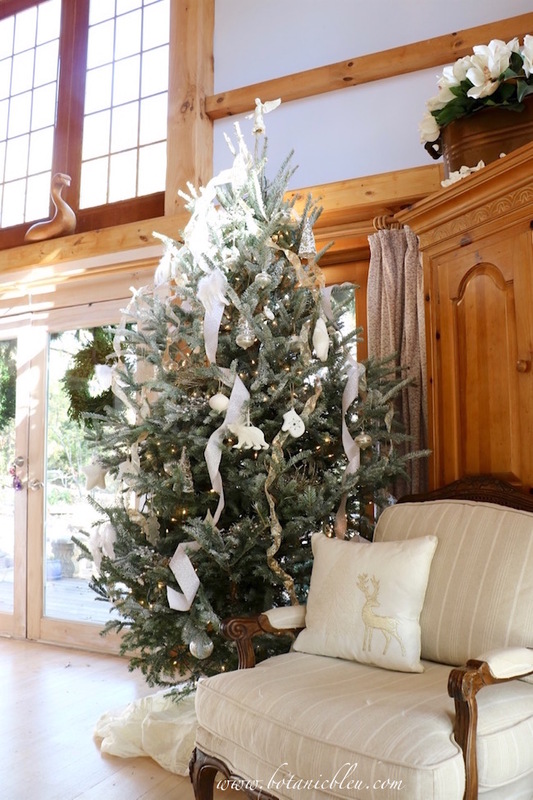 Opposite the mantel, a fresh cut Fraser fir tree is decorated in whites, silvers, and sparkles... mixing my old favorite tradition of real greenery with the new tradition of artificial sparkle. A detailed look at the tree is coming in a future post. Glittery silver birds' nests, bejeweled white ribbon, and jeweled glittery stems join white jeweled ornaments for lots of sparkle. 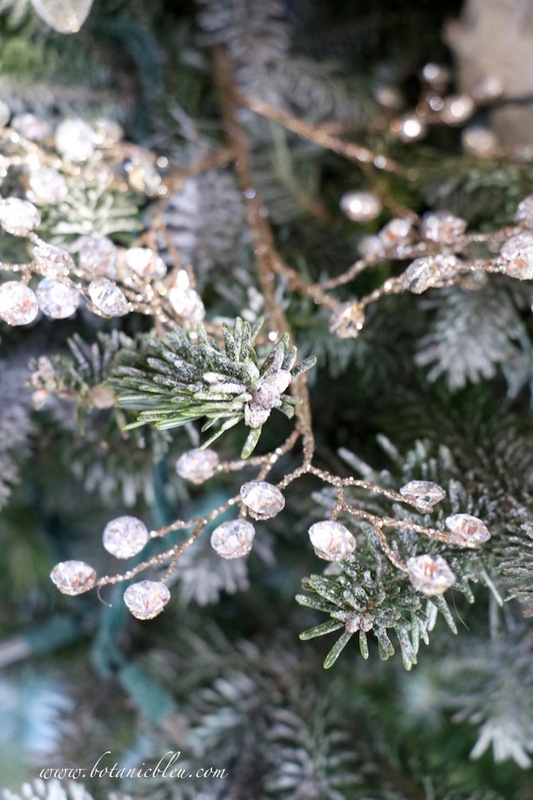 The jeweled glittery artificial sprays are the stars of this year's Christmas tree. Each faceted crystal sparkles like a diamond and more so at night when the fairy lights on the tree are lit. 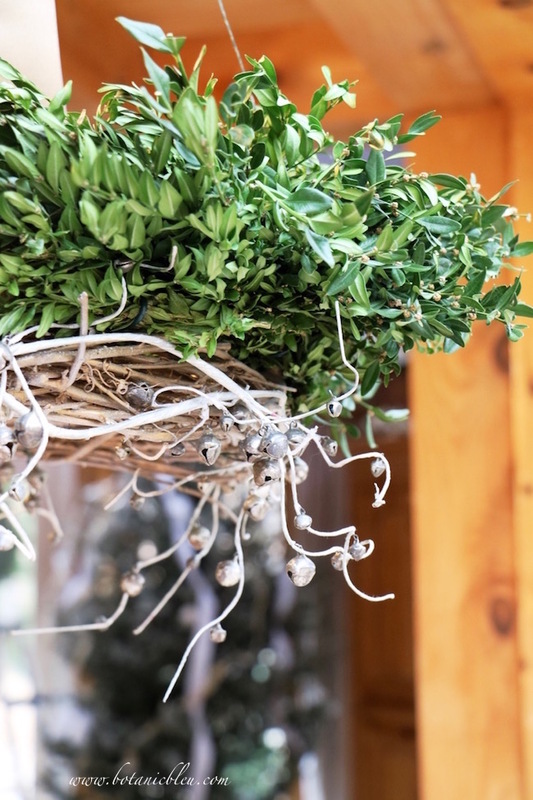 And the star of this year's Christmas decorations in the sunspace breakfast area is a hanging fresh boxwood wreath paired with a homemade white thorny wreath and silver bell garland. 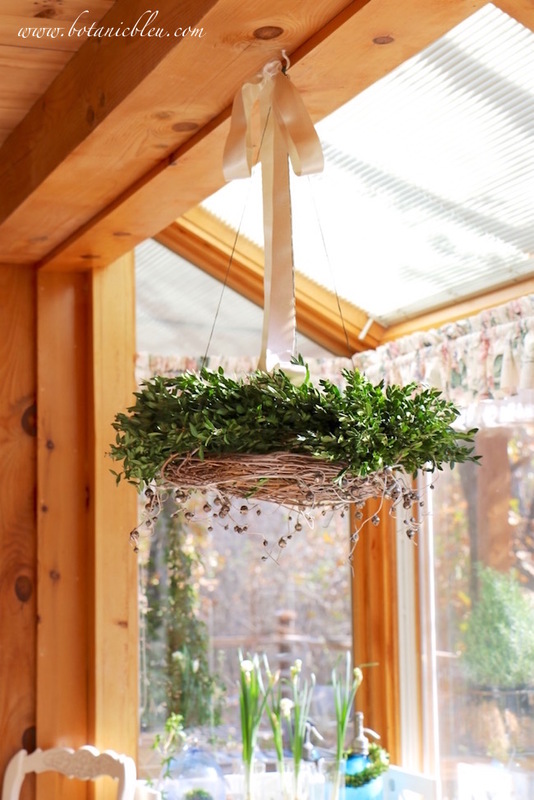 The hanging wreath is another combination of an old favorite fresh greenery paired with a new sparkly look. There are still touches of more traditional fresh greenery in the breakfast space. A rosemary conical tree in a French style white pot sits on the top shelf of the plate stand. A big challenge for me is keeping fresh rosemary plants alive in the house, but I love their look and fresh scent. A small fresh flower arrangement made from white gerber daisies and a mix of fresh greenery sits on the breakfast table next to a hand-carved wooden Russian Father Frost. A pretty seasonal flower arrangement is easy to make from greens trimmed from the bottom of fresh trees and shrubs in the yard. Small white daisies from the grocery store are all that's needed to add to the fresh greenery. For three or four years I've been admiring horizontal wreaths hanging above tables inside and outside. Every photo started me thinking I would like to hang a wreath horizontally. This year is the year! A hanging wreath is much easier than I thought it would be, and I will be hanging more horizontal wreaths in the future. Each little silver bell jingles when the wreath moves. If you would like to hang a horizontal wreath in your house this year, there is a post with details coming in a few days. 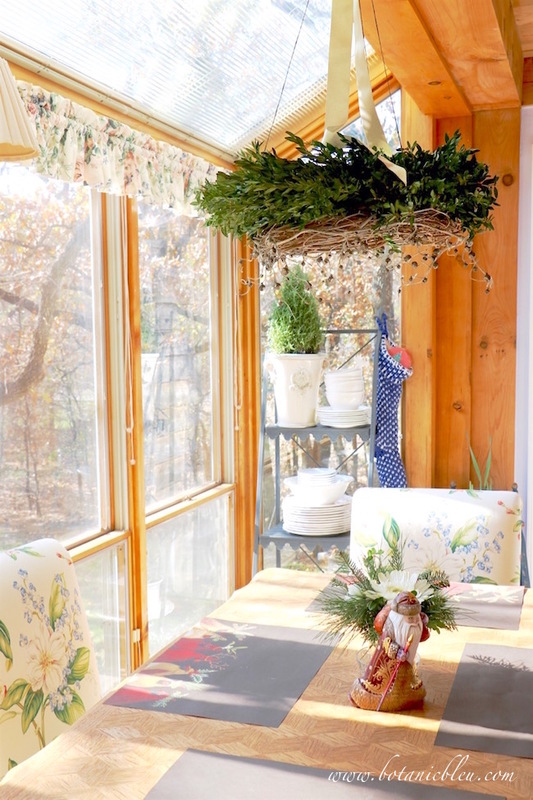 Stop back to see step-by-step directions for how I put together the hanging wreath above the breakfast table. 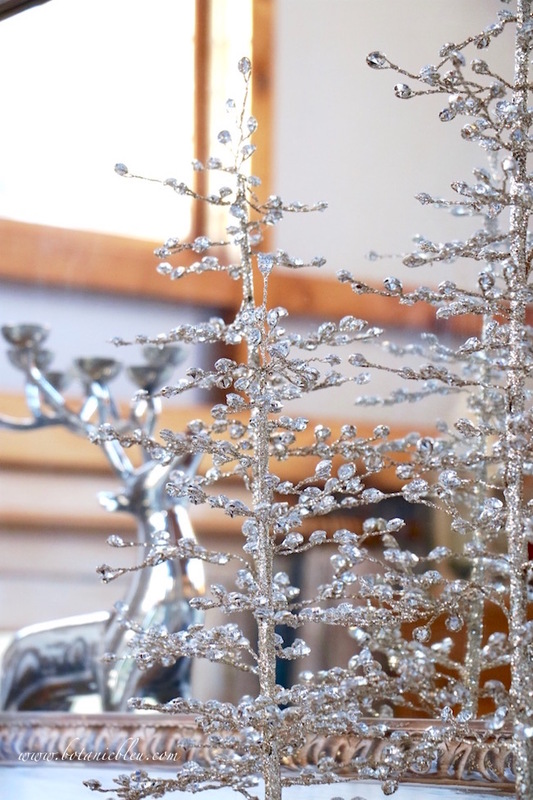 This year is all about white, silver, and sparkle added to traditional fresh greenery. Please hop over to see my blogging friends' beautiful Christmas ideas. It is gorgeous. I love that the reindeer is still relevant. The sparkles on the mantel and in the tree are just perfect. I can't wait for a more detailed post about it. Thanks for being a part of our tour. Your mantel is gorgeous. 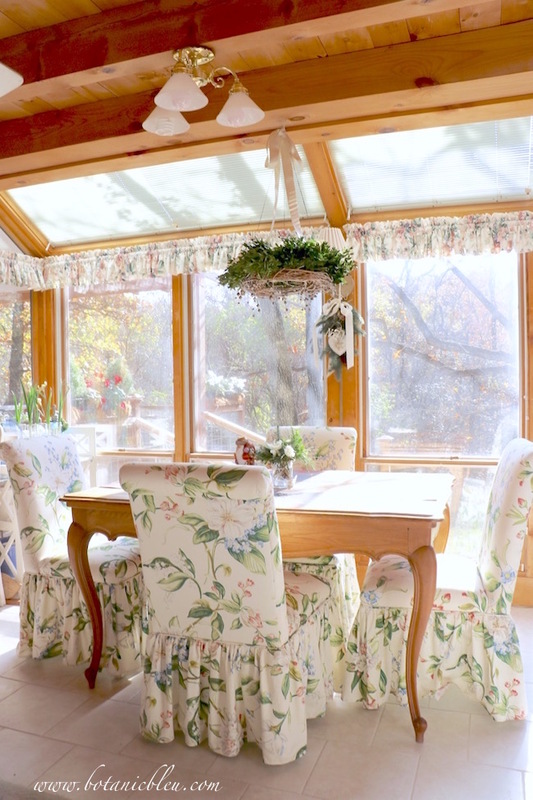 I love the paperwhites in the background of your beautiful breakfast room. 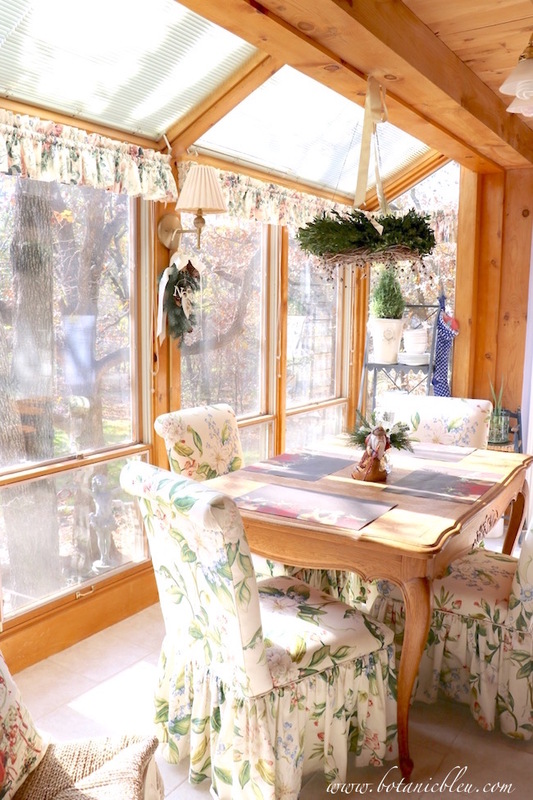 The wreath over the table is just charming. Thank you for sharing your inspiring decor. Beautiful, beautiful Judith!! You have such a gift for creative pretty spaces. I love to see what you do each season. It was so much fun seeing you the other day! Your home is lovely and seems to be the perfect mix of greens and glitter. The tree with the sparkely ornaments running down the limbs made me sit up and take notice. I've never seen such pretty additions to enhance the limbs like that! Your home is lovely from top to bottom. I love the combination of sparkle and greenery. 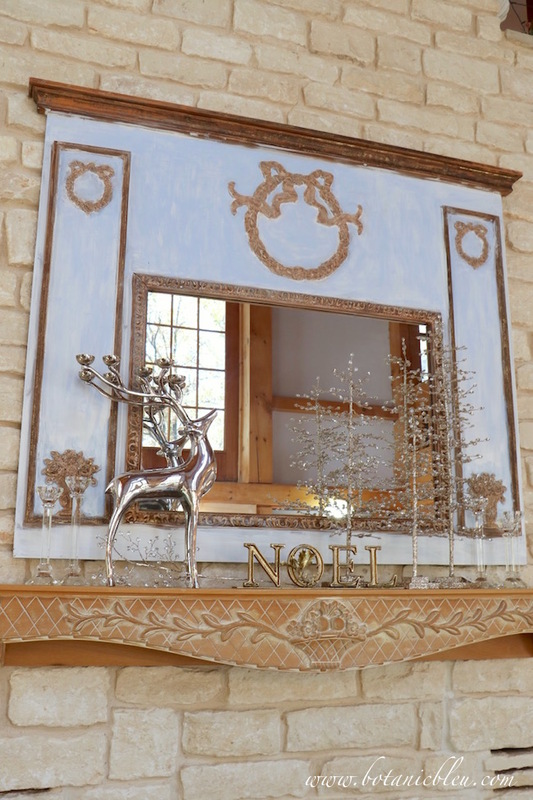 I have the same reindeer that you have on your mantle, they are a favorite at our house too. Such a beautiful home! I noticed you had paperwhites growing in your breakfast room - love them. Thank you for sharing your beautiful home! I am forever a magpie who loves sparkly things but there is something so breathtakingly beautiful in simplicity. You've captured both qualities so well in your home. I love your sparkly and elegant mantle. You did a great job on the horizontal wreath. It looks great. I do relate to your comments about changing styles of decorating. I'm reading all the blog tours and one minute wanting to change all my decorations and the next not wanting to let go of years of collecting. Judith it was so nice meeting and sitting by you at our luncheon on Tuesday! Your home is beautiful and oh my golly those picks with the diamond edges are fabulous. Love the wreath over the table too. I want to figure out a place to do that in my home. Merry Christmas! Such pretty,elegant decor....love your sweet breakfast area. Judith, your sparkly home is marvelous! I always admire what you do! Your home would look fantastic no matter how you decorate, but seem to have just the touch for making things magical. Love all your sparkle! Really like the trees on your mantel. They are so pretty! Your home, your talents, your eye for fabulous details are always a delight to your readers! Such sparkling magic and wonder. Indeed you have captured the glory of the Christmas season. I am in desperate need of a new camera-it has officially worn out, what camera and lens do you recommend? Thank you and it was so lovely to see you this week. Judith, it was so nice meeting you this week. Your home is truly spectacular. Love coming over to your blog because you have such a beautiful way of presenting things. Simplicity and light details always catch my attention because it tells a story that speaks volumes... Hope your Christmas is wonderful. Wonder why I’m just getting this post today? Better late than never, because your displays and vignettes ALWAYS wow me! And this one is no exception. Simply perfect. I never tire of seeing your breakfast area. It is just perfect - from the architectural design to the beautiful table and chairs. Just lovely. Your Christmas decor is also beautiful. Merry Christmas. Judith, everything is just gorgeous! The sparkly trees on the mantel are so pretty and I love the horizontal wreath over your table. Pinned your tree to my Holiday Tree board. Your house looks so elegant this Christmas season. 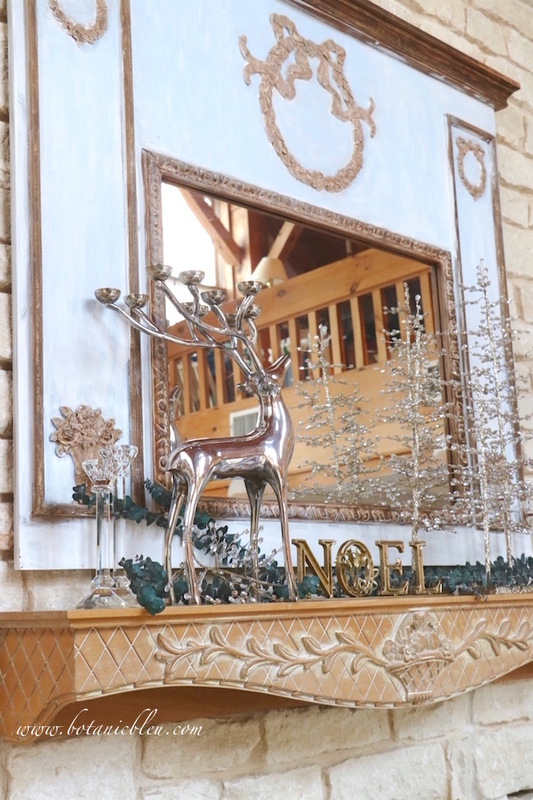 Your mantel is gorgeous, and I find myself in NEED of those sparkly trees! Wherever did you find such an item???? You know that I love your beautiful home and especially your sunspace! !